For the railroad of the same name, see Illinois Terminal Railroad. 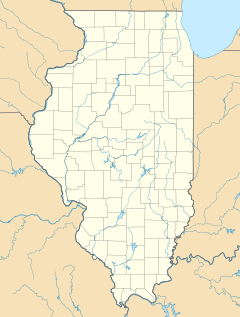 The Illinois Terminal is an intermodal passenger transport center located at 45 East University Avenue in Champaign, Illinois, United States. The facility opened in January 1999, and provides Amtrak train service and various bus services to the Champaign-Urbana area. Owned by the Champaign-Urbana Mass Transit District, the building also houses a Subway restaurant, the Champaign office for Michael Frerichs, Illinois State Senator for the 52nd District, and the offices of the Junior League, as well as a school, meeting spaces, and banquet halls. Illinois Terminal was built with funds provided by the Federal Transit Administration, Illinois Department of Transportation, the Champaign-Urbana Mass Transit District and the city of Champaign, and was named for the Illinois Terminal Railroad, an electric interurban line that ran from Champaign, and at one time extended as far as St. Louis. The track and platforms of the Illinois Terminal are owned by the Canadian National Illinois Central Railroad. There is a short term parking lot in front of the building with long term parking available off Water Street east of the tracks. ^ "Amtrak Fact Sheet, FY2014, State of Illinois" (PDF). Amtrak. November 2014. Archived from the original (PDF) on 26 January 2015. Retrieved 24 February 2015. ^ a b Illinois Terminal Information." CU-MTD. Retrieved on July 15, 2009. ^ "Mike Frerichs – Loan Advisor". mikefrerichs.com. This page was last edited on 23 October 2018, at 14:26 (UTC).